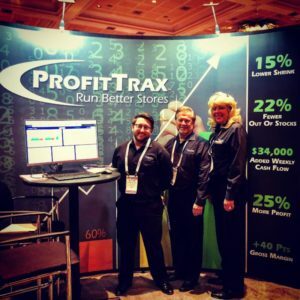 From February 11th to February 13th, the ProfitTrax Team had the pleasure of sharing brand-new improvements to ProfitTrax BI at the 2018 National Grocers Association Show. This was a very successful year for the Association and we want to share some highlights with you! Retailers and Vendors alike enjoyed the great turnout for this year’s show. There were over 40 Educational Workshops and the show offered an excellent networking opportunity for Retailers and Vendors. Our ProfitTrax Team met with 22 interested Retailers and 4 Business Partners in 10 Show Floor Hours. 90% of the Retailers we surveyed mentioned the need for synchronized BI Analytics and Best Practice Training in their Stores. Holding Managers accountable to complete StoreWalk Checklists is also a necessity, but a present failure. Our ProfitWalk Action Alert System was a welcome solution to this problem. Executives have received constant complaints from their Store Teams about the number of Reports they are emailed weekly. The ProfitTrax Platform was praised for integrating many of these reports into one, dynamic reporting system for a one-stop Enterprise Solution serving Operations, Loss Prevention and Merchandising. Many Operators said that Store Teams have a slim Window of Opportunity to correct negative performance. Failing to do so results in exponential consequences. To streamline Manager workload and keep the focus on Customer Service, ProfitTrax provides higher visibility into POS Sales Data, Shrink Loss Data and Out of Stock Tracking. 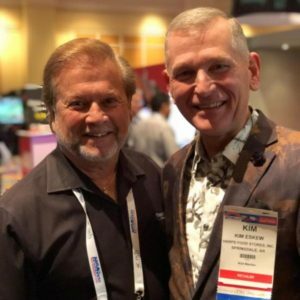 Larry Miller – President of ProfitTrax – and Kim Eskew – President of Harp’s Food Stores – shared similar beginnings in Grocery, but their courses diverged in the 90’s when Larry began Trax Software while Kim rose to lead Harp’s Food Stores. The NGA Show gave them time to catch-up and share ideas for the future. Supermarket Grocers of all sizes are encountering similar P+L problems, including excessive Shrink Loss from Operations Inefficiencies, Profit Erosion, and Standards for Out of Stock Reporting. ProfitTrax helps Managers to exceed P+L objectives by attacking these issues. 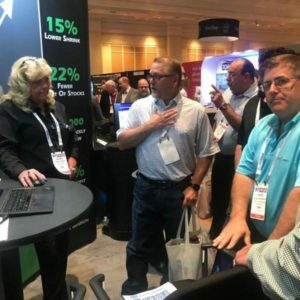 There were many great takeaways from the 2018 National Grocers Association Show in Las Vegas. Did you have a different perspective on the Highlights of the show? Would you like more information on any of the insights that we shared above? Our Team would love to keep the conversation going, so if you’d like to share your perspective and be featured in our next Newsletter, please CLICK HERE to send us your thoughts! ProfitTrax BI is the premier Cloud-Based Enterprise Business Intelligence Software developed by Smart Retail Solutions – interprets store-wide data, performs multi-dimensional analysis, and generates Natural Language Action Alerts using proprietary Narrative Science.ProfitTrax focuses on improving Operational Effectiveness by increasing Top Line Sales while reducing Bottom Line Shrink Loss.Unlike other BI Providers, SRS integrates Store Operations Best Practices within their Data Analytics to encourage positive behavior change throughout the Enterprise. 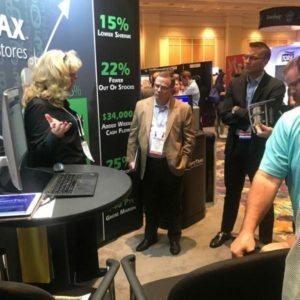 Smart Retail Solutions is the only SaaS Provider in the Retail Industry that Guarantees Profit Improvement & Workforce Productivity Optimization in just 90 Days.If your team isn’t sustaining a profitable operating environment, let’s talk.